My magic show is filled with fantastic, funny, fast-paced routines that will make the children laugh out loud from start to finish. My shows have tons of visual comedy, I get helpers up at every opportunity to help (though I never force them to if they are shy) and the whole audience is invited to help me in a variety of fun creative ways. I have different magic shows for all kinds of audiences and ages; my magic show for young children is jolly and colourful, my magic for older children is edgy and daring, and I have loads of magic that appeals to all ages. I write much of my magic myself, which hopefully means I will be performing magic you will never have seen before, with incredible inspired ideas and impressive routines. You can find out more about the magic that I perform here. I entertain with a short but rather splendid show with my magic mice, Frostie the Fox and Stinky Bird. Remember, never feed Stinky Bird cheese or it may give him a funny tummy and he might start laying eggs everywhere. I can make a dozen or so different animals, and also dinosaurs, dragons, flowers, magic wands, swords, aliens and loads of silly hats too. I host exciting party games and dancing, and entertain with close-up magic for children at the very start of the party as they are arriving. Amazing magic shows - My magic shows are funny, fast-paced and crammed full of impressive magic just as magic shows should be. They are usually 45 or 60 minutes but can be longer or shorter on request and can be repeated throughout the day if required. I have performed magic shows in schools, nurseries, shopping centres, holiday resorts, pubs, trains, sporting events, festivals, libraries, company parties, kids clubs and for housing associations. I have even performed magic shows in prisons, dental surgeries and even once in a church graveyard! Walkabout entertainment - wonderful roaming magic for both indoor and outdoor events. Small close-up magic out of my pockets, larger magic out of my suitcase, and all my roaming magic is charming and funny. Balloon modelling too. 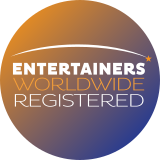 I am an official member of Equity Children's Entertainers, have £10m public liability insurance, and am fully DBS checked (please note that children's entertainers for parties don't actually need a DBS nowadays as the laws have changed. I have one for after-school clubs, chaperone duties and similar jobs). I am the ideal choice for childrens entertainers in Surrey. childrens entertainers in Sussex and also in South London and Kent too. My most important clients are the mums and dads of the world, and the children whose parties I entertain at. Most definitely! Other important clients that I have performed for include Walt Disney Special Events, The Barbican, 10 Downing Street (for Barnardos), The Hurlingham Club, Barclays Bank, Selfridges, Hamleys, Bond Street, Royal Military Academy Sandhurst, The RAF, the Metropolitan Police, Microsoft, Audi, Lloyds, Odeon Cinemas, Kelloggs, Nintendo, Ikea, Goldman Sachs, Chelsea Football Club, London Zoo ZSL, Ben and Jerry's, PricewaterhouseCoopers, Butlins, Sky TV, BMW, RBS, Tokiomarine Kiln, Threadneedle Investments, Vosene, Chessington World of Adventures, Thorpe Park, Royal Caribbean Cruises, Odeon Cinemas, Waterstones and for many shopping centres, hotels, clubs, festivals, celebrities, health clubs, residents associations, local councils, dental surgeries. schools, libraries, loads of PR companies and both public and private events of all kinds. WHAT MAKES A GREAT PARTY? WHAT MAKES A PARTY GREAT? Having over twenty years of experience means I know what makes for a perfect party from start to finish. I am expert at keeping children fully engaged and happy throughout a party or event and I have so much energy, enthusiasm and love for entertaining I'll keep all the children thoroughly thrilled every step of the way. I am also very flexible and will listen to your individual needs and wishes about what you need to make your party right for you and for the birthday child. I have a great understanding of what children find funny, I know how to delight and enchant them and how to keep their interest peaked at all times. I also pack loads of different exciting elements into a party, keeping it all thoroughly fresh and fun throughout and making for a truly memorable occasion for all. I have now moved from Bromley to East Grinstead but I still do loads and loads of children's parties in the Beckenham, Bromley and West Wickham areas - I'll come back and entertain for you at the drop of a hat! I also entertain in the following areas (and many more besides): South London, South-East London and South-West London - including Kingston, Teddington, West Wickham, Twickenham, Wimbledon, Raynes Park, Wandsworth, Fulham, Hammersmith, Richmond, Merton, Sutton, Croydon, Coulsdon, Lewisham, Hounslow, Greenwich, Blackheath, Bromley, Beckenham, Petts Wood, Dulwich. West Kent - I will be your children's party entertainer in, amongst many others, Royal Tunbridge Wells, Tonbridge, Sevenoaks, Orpington, Maidstone, Edenbridge, Biggin Hill, Dartford, Sidcup, Swanley. Surrey - children's entertainer Surrey in towns and villages including Woking, Staines, Chertsey, Weybridge, Hersham, Epsom, Esher, Caterham, Dorking, Reigate, Oxted, Leatherhead. East Sussex - children's entertainer Sussex in towns and villages such as Brighton, Lewes, Uckfield, Forest Row, Haywoods Heath, Eastbourne and all the villages inbetween. West Sussex - children's entertainer West Sussex in towns and villages in East Grinstead, Haywards Heath, Crawley, Horsham, Worthing and all the villages inbetween. North London, East London, West London, Essex, Hampshire, Hertfordshire, Middlesex and beyond. The new showreel for my company School Magic Shows (guess what we do there!) is now finished and looking great. You can see it on YouTube at https://youtu.be/hHBiMVkfl8M or on the videos page of this website. All shot and edited in less than a week. I'm also shooting snippets of video for the entertainers at the Kids Entertainers Network. Lots of potential clients and parents like to see a video of entertainers in action, and videos are so much easier to put together nowadays. We rented out the local hall for a few days, put up my gold sparkly backdrop and asked them to perform a fun routine or two. Easter is looking busy already for me, with lots of egg and bunny fun on most days over the Easter weekend! Quite a few weekdays still available over the holidays if you'd like to make a booking, but don't leave it too long as it's getting busy now. Hi! I'm Andy Hiccup. I'm a fun, friendly children's entertainer and children's magician for birthday parties and other family events. I'd love to come and entertain for you whatever the occasion, and I cover Surrey, Sussex, South London and Kent. I am full of fun, smiles and boundless energy and will bring excitement and joy to your event in bucketloads. Children's birthday parties and other events - your children will simply love my party entertainment. My parties include a hilariously funny magic show, balloon modelling, party games, crazy close-up magic and cheeky puppets. All absolutely ideal for kids parties and also for other kinds of family functions too. I usually entertain children from 4 - 11 years. FEES: I have good competitive prices for magic shows, and for hour-long, ninety minute and two hour parties. I also have attractive fees for half-day or all-day events. If you're local to me, or if your party is on a weekday, I give discounts too. Hooray! Please do contact me for my most up-to-date party prices by either clicking here or by emailing me at andy@andyhiccup.com. I'd love to hear from you.